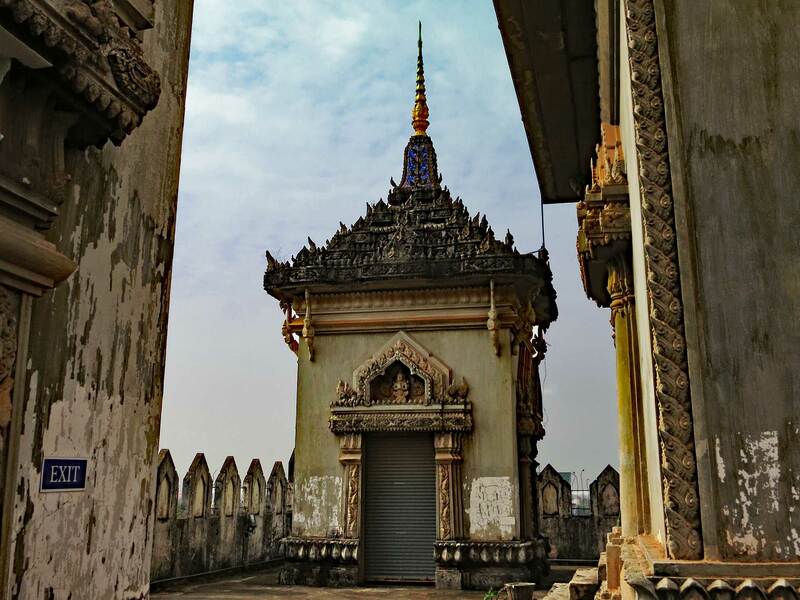 When travelers reminisce about touring Laos, they inevitably describe it as “laid-back.” Laotians are predominantly Buddhist, there are vast swaths of undeveloped countryside, and an aura of serenity seems to hang in the air. 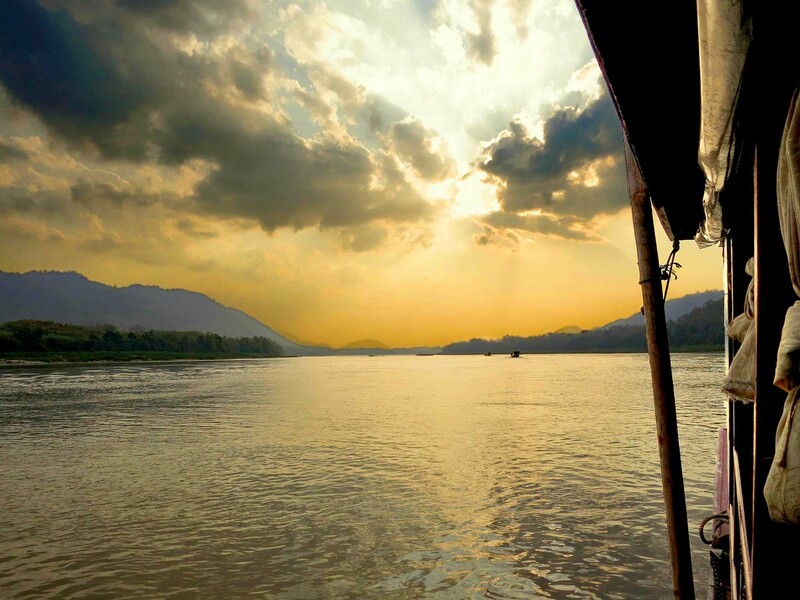 Though landlocked, Laos has an abundance of rivers and streams flowing through its hilly terrain. 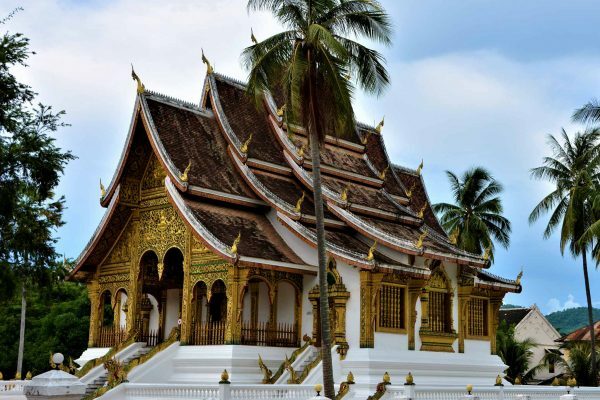 Visitors usually fly into Luang Prabang or the capital, Vientiane, but we recommend beginning your tour in northern Thailand and arriving in Luang Prabang by boat, via the Mekong River. It’s a tranquil journey through a mountainous landscape, with friendly children waving as they splash in the river and water buffalo graze along the banks. Laos has fantastic accommodation options. In Luang Prabang, luxury boutique hotels are found both in the center of town and in the peaceful outskirts. Some of these hotels make use of lovingly renovated colonial buildings. 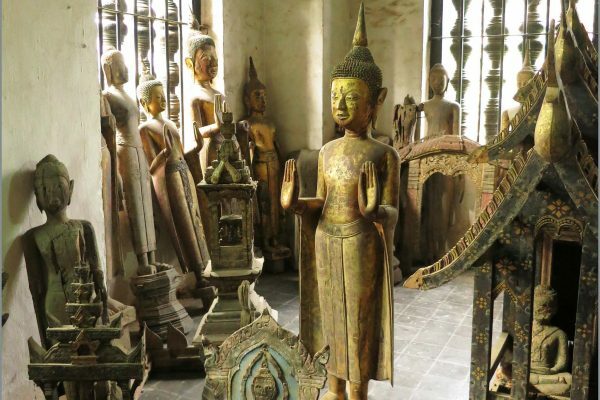 In Vientiane, boutique hotels occupy lovely colonial buildings amid a growing number of newer, five-star hotels. Hotels in Laos tend to be small, with 35 rooms or fewer, making for a charming and intimate stay. 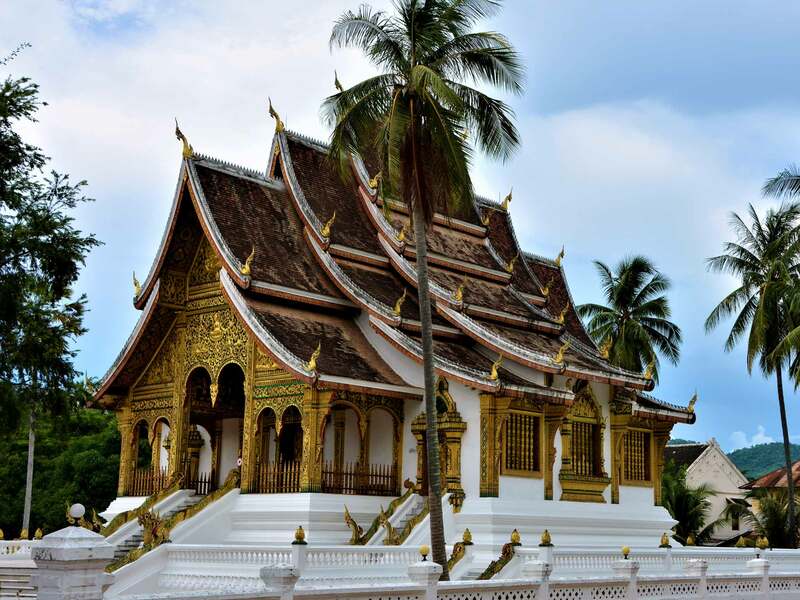 The entire town of Luang Prabang is a UNESCO World Heritage Site. It is quite compact and easy to traverse by foot or bicycle. For a lovely view of the town, climb the 300 steps to the top of Mount Phousi. The former Royal Palace houses the National Museum, which has a contemporary photography gallery and a temple on the premises. 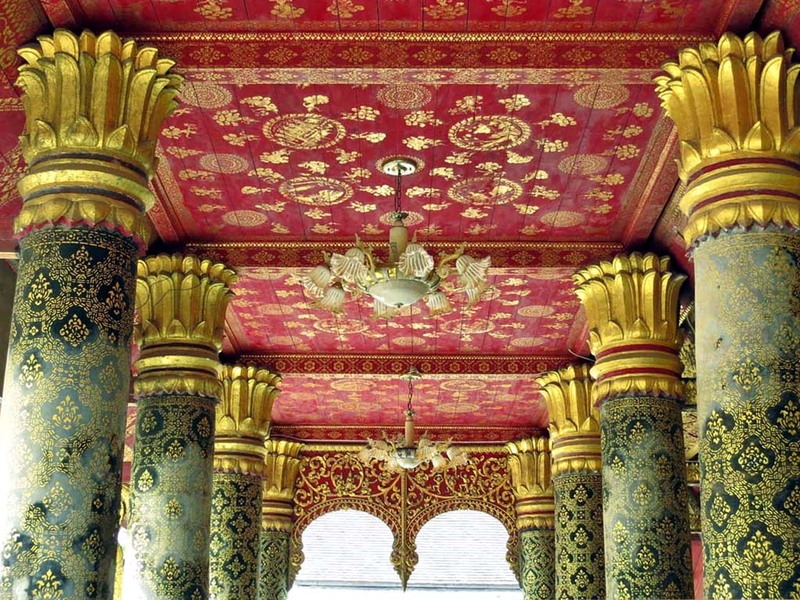 Ornate Buddhist temples can be found all over town. Our favorite is Wat Mai Suwannaphumaham, formerly the royal temple. On the grounds of Wat Xieng Muane sits the Heritage House, a prime example of Luang Prabang’s traditional wooden building techniques. 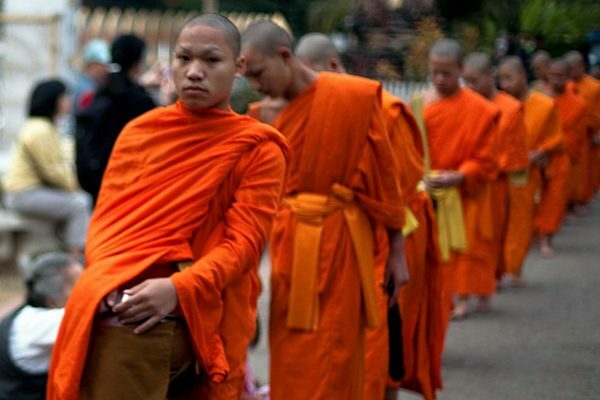 Early each morning, monks clad in orange robes line up to make their rounds to collect alms from locals, securing all the food they will have for the day. You can watch the procession and make offerings of your own. In the mysterious Pak Ou Caves, north of Luang Prabang along the Mekong, thousands of golden, lacquered statues of the Buddha adorn two caves hewn from a towering limestone cliff. The statues range from palm-size to life-size. On our private cruises, we take guests to stop on the way back at small tribal villages and temples along the banks. 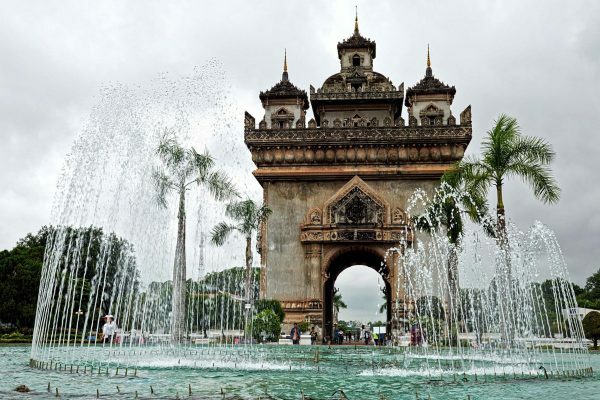 The citizens of Vientiane are very proud of the Patuxai Victory Monument, the Laotian-style ceremonial arch they call their own Arc de Triomphe. From its rooftop you can take in a panoramic view of the city; visit just before sunset for especially stunning views. The lovely Wat Si Saket is remarkable for the thousands of miniature antique Buddha statues placed in nooks in its walls. It’s thought to be the oldest original temple in the city. 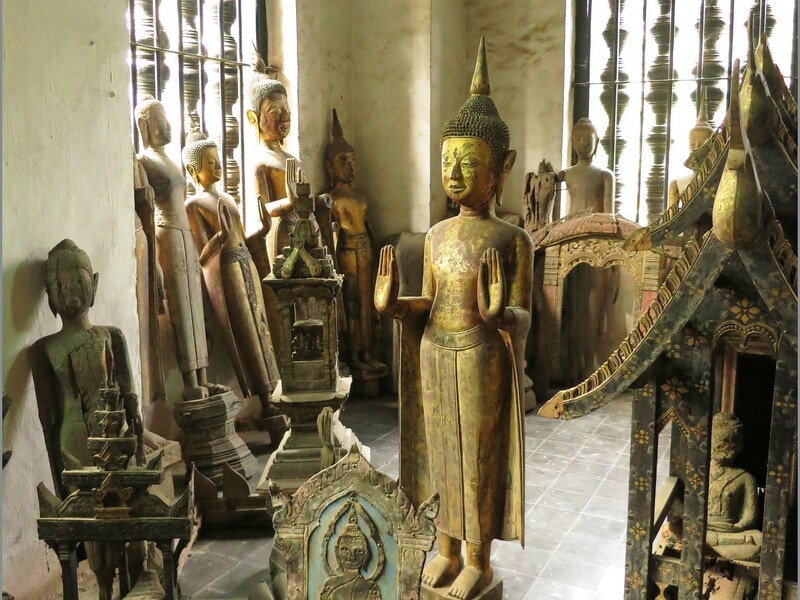 Another significant temple is Wat Phra Keo, now used as a Buddhist museum, where priceless Lao and Khmer artifacts are on display. Hundreds of years ago, the Emerald Buddha (now on display at Bangkok’s Royal Palace) was enshrined in an earlier version of the temple. That Luang, the Great Stupa, is the holiest place in Laos and the destination of a three-day pilgrimage each November. 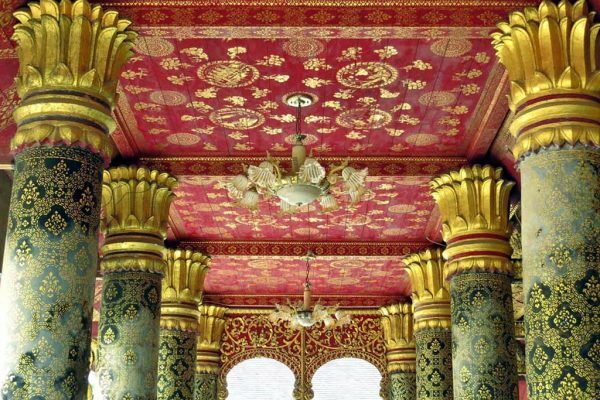 This iconic, gilded structure appears on all bank notes and official stamps in Laos. 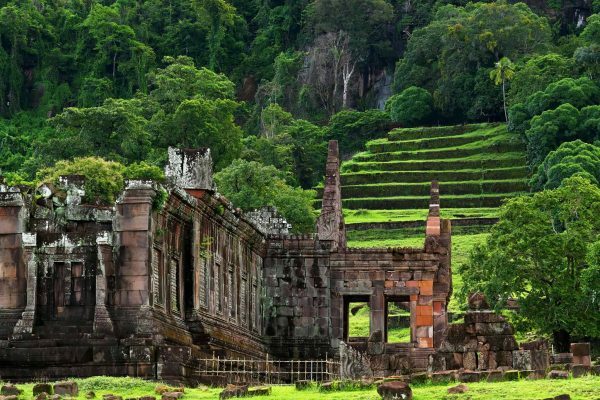 In southern Laos, in the province of Champasak, is Wat Phou Temple, Laos’s second UNESCO World Heritage Site. 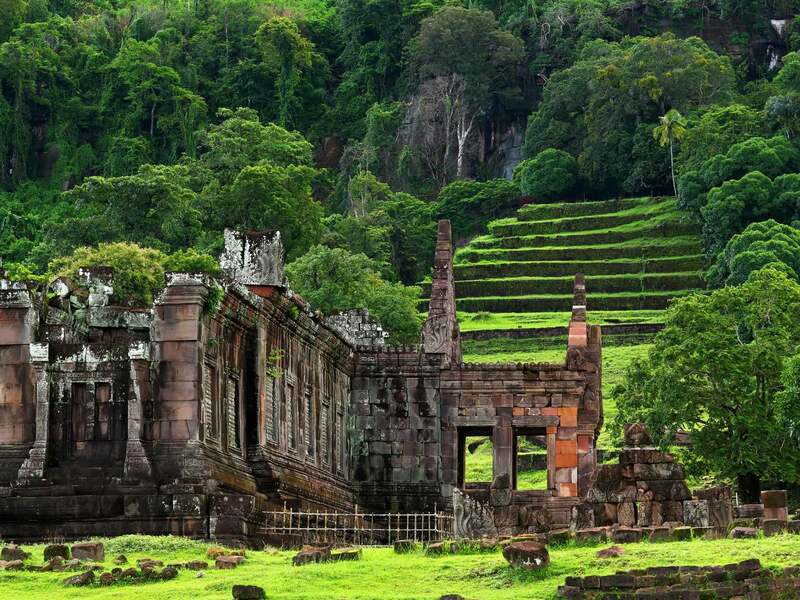 Constructed two centuries before Angkor Wat in Cambodia, Wat Phou is a well-preserved example of Khmer architecture. The main temple occupies the upper terrace of the complex; an ancient planned city extends for miles around, with shrines, palaces, and other structures. 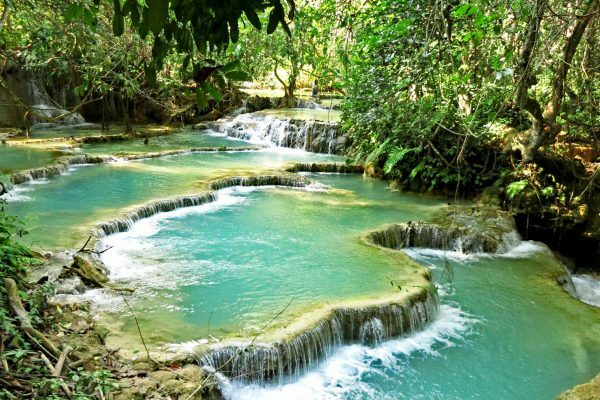 The lush forests, rivers, and mountains of Laos make it a perfect destination for adventure and eco-tourism. 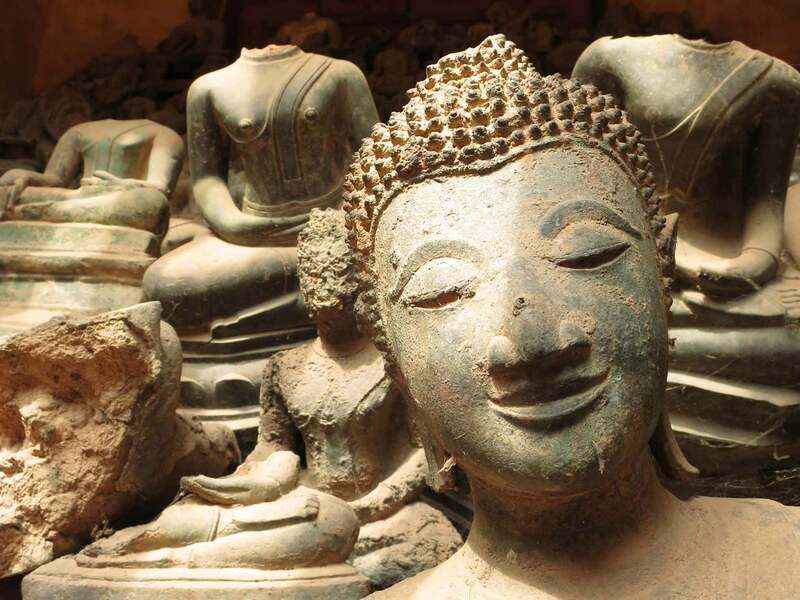 You can see the real Laos while off-road cycling, hiking up lush, wooded mountains, kayaking the rapids of the pristine Nam Xeung River, or giving playful elephants a bath at a humanely run elephant sanctuary. Just outside Luang Prabang is the Kuang Si Waterfall. Walking along the forest path, you see natural pools of beautiful blue-green water. You can stop to swim, even ride a rope that’s tied to a tree branch, Tarzan-style, into the water. In the same area is the Bear Rescue Center established in 1995 by the Free the Bears Fund. It cares for orphaned, injured, or sickly bears at the facility, reintroducing them to the wild whenever possible. In southern Laos, near the Cambodian border, the Mekong River widens in the region known as the 4,000 Islands. 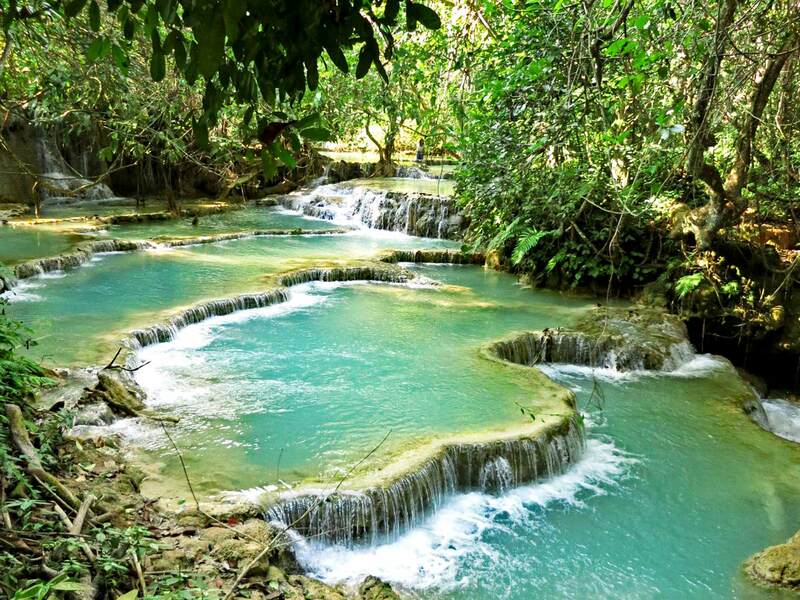 A major draw here is Khone Falls, a magnificent series of cascading waterfalls—the world’s widest. 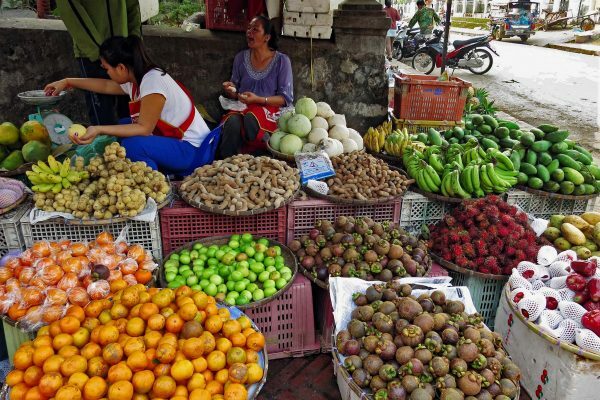 Luang Prabang has a daytime Hmong Market for produce and textiles and an extensive Night Market that stretches along Sisavangvong Road, the town’s main street, itself lined with restaurants, cafes, and boutiques. The vendors here are relaxed and will not pressure you to buy. Locally produced artwork, woven textiles, decorative items, and T-shirts are among the goods on offer. Strolling the Mekong Promenade & Night Market makes a pleasant finale to a day of touring in Vientiane. Many stalls sell souvenirs and local snacks. Look for stalls selling unique, recycled items such as jewelry handcrafted from parts of bombs that were dropped in Laos during the Vietnam War. 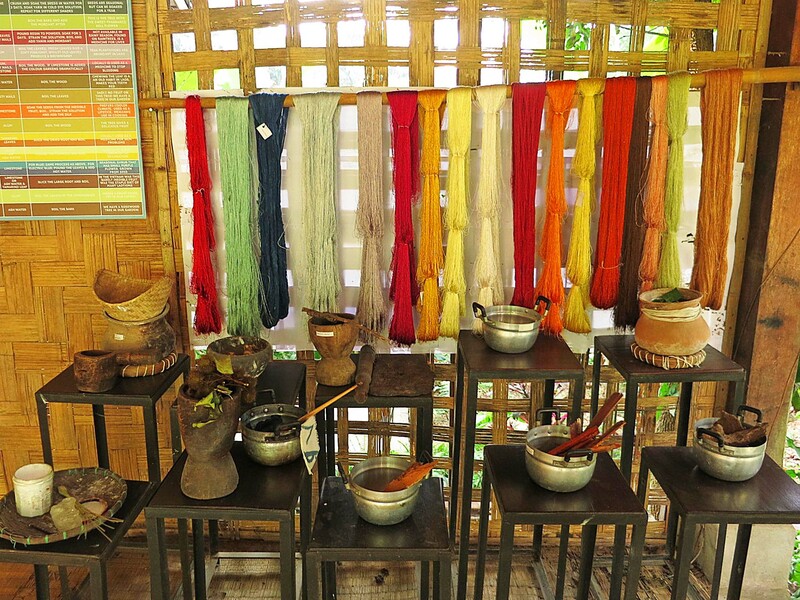 Ock Pop Tok, also in Luang Prabang, comprises a fair-trade weaving center, a shop, a café and a nonprofit organization called Fibre2Fabric. 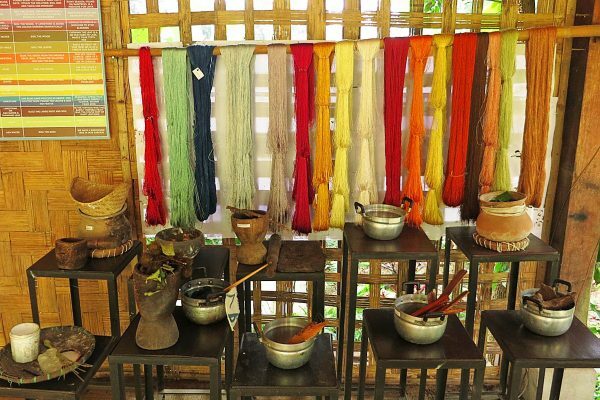 Visitors can tour the facilities or enjoy a hands-on class in natural dyes, scarf-weaving, Ikat, silk-making, creating a Hmong batik, paper-making, and more. OPT also has a shop in Vientiane. Carol Cassidy’s Lao Textiles workshop in Vientiane is a dream for those who appreciate hand-woven textiles. Visitors can tour a small factory on the premises and watch weavers work on silk textiles in various stages of production. The shop sells beautiful scarves, shawls, wall hangings, and cushion covers. 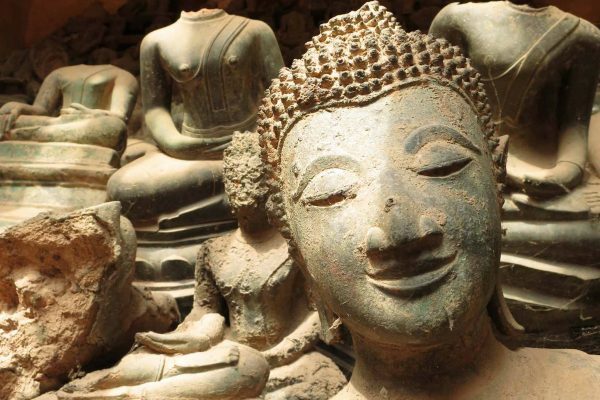 Customized tours in Laos starting from US$500 per person/per night. 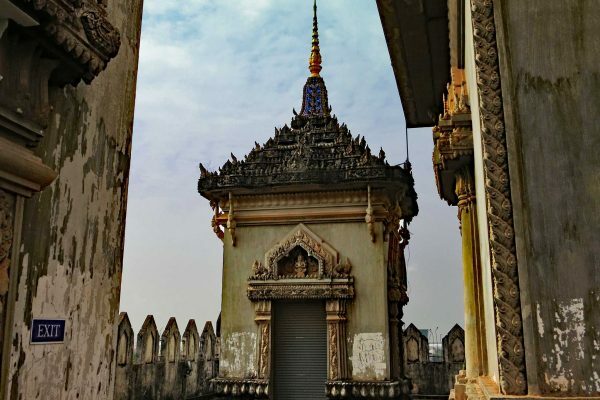 Laos shares borders with Thailand, Vietnam, Cambodia, Myanmar, and China (Yunnan Province), so we can easily combine your Laos tour with travel to any of those countries. 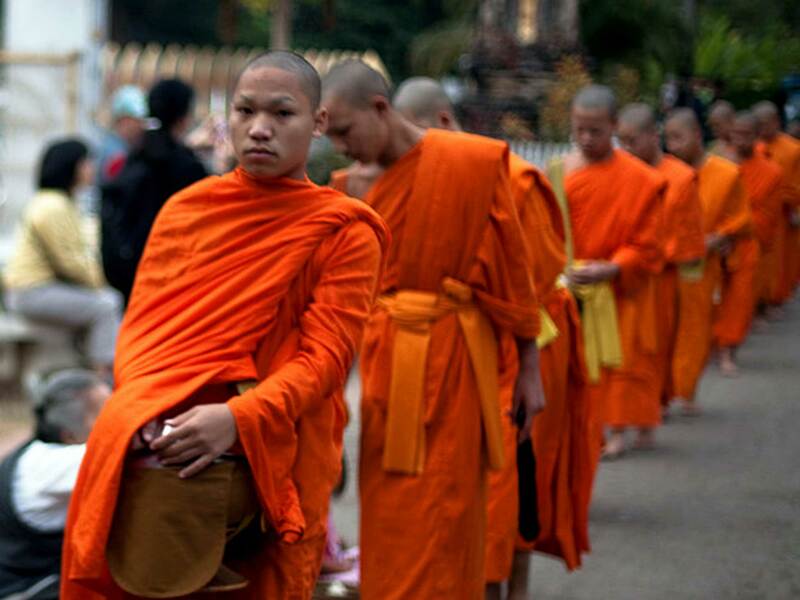 Most of our itineraries for Laos begin in Luang Prabang or Vientiane. Both have international airports with direct flights from Bangkok, Hanoi, Kuala Lumpur, Siem Reap, and Singapore. Flights from China and South Korea also arrive in Vientiane. 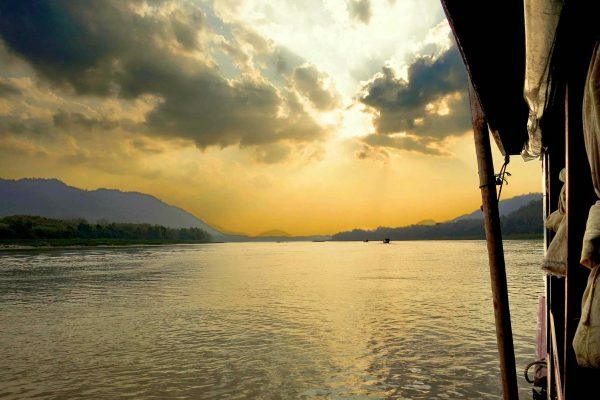 The Mekong River offers an additional way to arrive in, or depart from, Laos, via Chiang Rai in Northern Thailand. Laos is warm and humid most of the year, though it’s coolest during the dry season. A light cardigan, a jacket, or a long-sleeved button-down shirt can be useful for chilly interiors, cool early mornings (especially November-February), sun protection, and to cover up when visiting holy places. Many temples and palaces require that shoulders be fully covered (i.e., no tank tops or mere scarves over tank tops) and that dress be modest (knees covered with trousers, a long skirt, or at least capri pants—and no low necklines). Shoes must be removed at the entrance of most temples, so sturdy sandals or slip-on shoes will prove convenient. For strolling in the evenings, casual dress is fine for night markets, beach bars, and more casual eateries. A few high-end restaurants require men to wear closed/dressy shoes and long trousers. 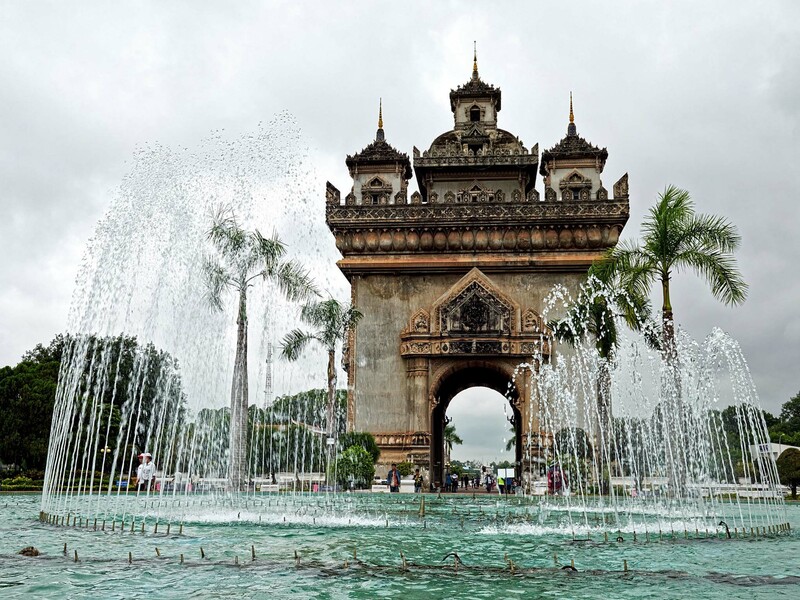 Laos’s climate is warm and tropical, with a dry season (November-April) and a wet season (late May-October). April and May are typically extremely hot (as high as 95°F/31°C) and are avoided by most travelers. Additionally, from March through May, rice farmers torch their paddies to prepare for the next planting season, and this creates an unpleasant smoky haze that covers most of the country. The early and middle dry season (November-early March) is the most popular time to travel to Laos, with average temperatures ranging from 57-88°F (14-31°C). The northern regions tend to be coolest, and temperatures are usually coolest late in the evening. We like to refer to the wet season as the “green season.” The rains bring rich, lush greenery and higher water levels in lakes and rivers. During this time, from May to October, there are fewer travelers and prices are lower. Most days, the rains come in the form of one or two brief, intense showers, with the rest of the day being clear. The rainfall is highly unpredictable, so there is some risk in traveling during this period. Caution should be taken in less-developed areas, where roads are unpaved and landslides are possible. 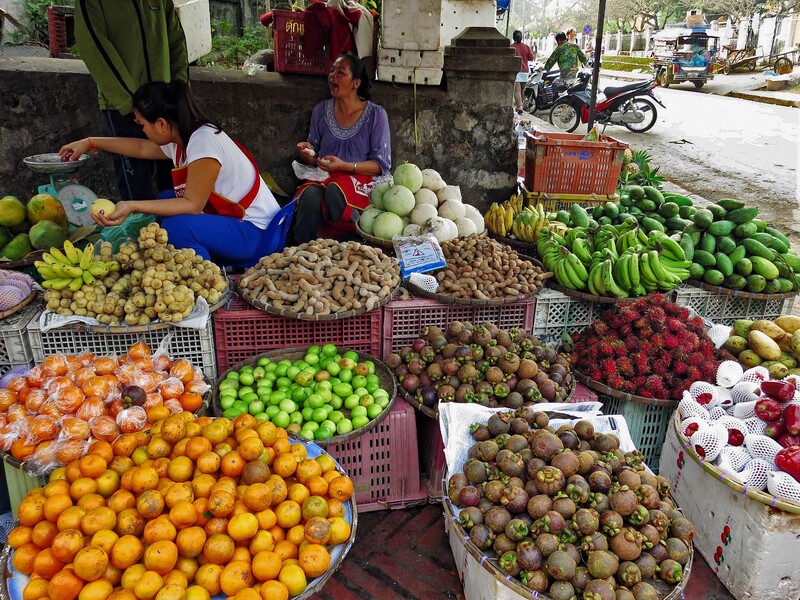 The weather in Laos is notoriously difficult to predict, so the actual conditions during your trip may vary.